How to Cut MP3 Files? Desiring to make some clips of your MP3 songs? Want to add effects to clips of your recording files to post on your website or on YouTube, make mash-ups, music clips and more? MP3 Cutter Joiner Free can do it perfectly. It provides visual cutting and editing in waveform. You can cut clips of any length from an MP3 song you like. What you need is just to click some buttons. Read on and let’s how to cut MP3 files with this easy tool. How to Cut MP3 Files? The first thing to do is download MP3 Cutter Joiner Free. 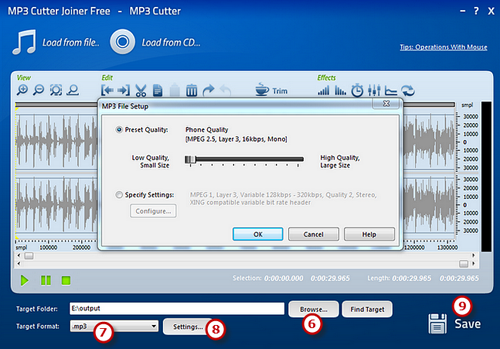 After installing MP3 Cutter Joiner Free, choose “MP3 Cutter Free” to launch. Click “Load from file…“ and a browser window will be activated. Then, select a MP3 audio file from your computer and click “Open” to input the audio file to program. If you want to input tracks from your audio CD, you should insert an audio disc into the drive and click “Load from CD…”. The added file will be displayed in waveform which is convenient for visual editing. Input the start, end or length of time to choose specified region at the bottom of the cutter. If you want to simply complete an easy cutting operation, just choose the part you want and click “Trim” to remove the unnecessary part of the audio and keep the selection. The cutter provides you various editing functions like cut, copy, paste, crop, delete and many more to edit the selected waveform. And if you’ve made some wrong editing, just use undo/redo to restore it. Click “Browse…” to choose an output folder for the cut MP3 file. Select MP3 as an output format from *.wav, *.mp3, *.ogg and *.wma in the “Target Format” drop-down list. Click “Settings…” to use the custom presets or specify the configuration parameters to adjust the output quality for every format. Then, click “Save” to output the file. When the processing window disappears, click “Find Target” to review the file you have cut. That’s How to Cut MP3 Files with the best free MP3 cutter software. How to Cut MP3 Files Differently? Audio Trimmer is an online app that can be used to cut MP3 files right in your browser. It’s totally free and easy to use and there is no need to install any third party programs. What you need to do is upload your audio file, choose the part you want to cut out and click crop. It’s designed to work on most devices including tablets and smartphones. However, it only supports limited audio formats like MP3, WAV, WMA, OGG, M4A and the max file size is limited to 100MB. If you can accept that, Audio Trimmer is a not bad alternative. It’s quite often that you will need an MP3 cutter to do some jobs like splitting a portion of a music file to create a ringtone for your mobile phone or cutting out the commercials from a radio program recording. There is a whole myriad of valid MP3 cutters around, but for straightforward tasks, MP3 Cutter Joiner Free is really a cut above the rest. 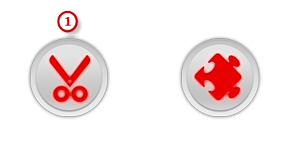 It’s an all-round audio cutting and joining freeware for cutting your MP3 files in the most convenient and efficient way. 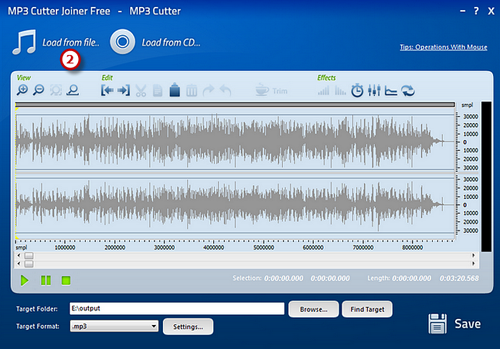 And you’ll be better off choosing MP3 Cutter Joiner Free, a lossless audio cutter that will cut your files speedily.